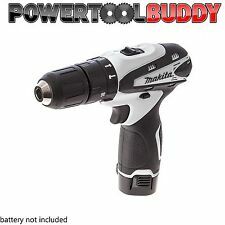 Makita HP330DZW 10.8v Li-ion Combi Drill White Bare Unit HP330. •Capacity in masonry: 8mm. •Torque settings: 18 drill mode. •No load speed: 0-1,300 rpm 0-350 rpm. BATTERY NOT INCLUDED . •Battery type Lithium-ion. The batteries within the kit are compatible with other Makita G series bodies. The HP457 Combi drill has been designed with an ergonomic handle and soft grip for your comfort and maximum thrust when you use it. Torque Settings: 18 drill. No Load Speed: (H) 0-1,300rpm ( L) 0-350rpm. Single LED job light with pre-glow function. Capacity in Steel: 10mm. Capacity in Wood: 21mm. Capacity in Masonry: 8mm. Makita HP457DWE10 18V G Series Combi Drill + 2 x 1.5Ah Batteries, Charger & Acc. Set in Carry Case. 1 x Cpmbi Drill Body. 5 X Masonry drill bits ( Ø 4 x 1 5 x 1, 6 x 1, 8 x 1 and 1 x 10 mm). 5 X Wood drill bits ( Ø 4 x 1 5 x 1, 1 x 6, 8 x 1, 1 x 10 mm ). 1 X Linear tail ( 1 x 8, 1 x 10, 1 x 12, 1 x 13 mm). 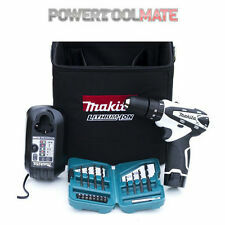 5 out of 5 stars - Makita HP457DWE10 18V G Series Combi Drill + 2 x 1.5Ah Batteries, Charger & Acc. 18 product ratings18 product ratings - Makita HP457DWE10 18V G Series Combi Drill + 2 x 1.5Ah Batteries, Charger & Acc. Compatibility - Makita G series products. Carry caseHeavy duty canvas cube. Battery typeLi-ion. Product Information. Number of batteries2 batteries. Net Weight: 1.5kg. No Load Speed (Hi): 0-1,400rpm. Blows per Minute (Lo) - ipm: 0-6,000ipm. Bl ows per Minute (Hi) - ipm: 0-21,000ipm. in Wood: 25mm. in Steel: 10mm. in Masonry: 10mm. Battery Type: Lithium-Ion. Specifications of the Makita HP347DWE. Combi Drill Features include Net weight: 1.5 kg. 16 Torque Settings. Max Torque S/H: 15 / 30 Nm. in wood: 25 mm. in masonry: 10 mm. in steel: 10 mm. During that process you will be issued with an RMA number. Country of Origin: China. The Makita Combo Kit Includes 2 Makita Batteries 1.5AH BL1015. All 10.8V So batteries can be used on other Makita 10.8V Slide Tools. CL106FD Cordless Hoover. ITEM INFORMATION. Stock Code: CLX203AJX1 This 2 piece kit contains 1 x HP331 Combi Drill, 1 x TM30 Multi Tool, 1 x DC10WC charger, stacking case and 2 x BL1020B 2.0ah batteries with 13 piece accessory set. HP331DZ Features: Slide type Li-ion battery.Electric brake.2 mechanical gears.Variable speed control trigger.Keyless Chuck.Equipped with Battery protection circuit: designed to protect the battery from damages due to overdischarge, high temperature or overload current.Forward and reverse trigger.LED job light.Ergonomic soft grip. TM30DZ Features: Variable speed control dial Soft start Anti-restart function LED job light Accessories can be installed at 30º increments, across 360º Ergonomically best possible barrel grip, with a perfect circumference size and shape whcih fits the hand for extra. MAKITA HP457DWE1018V 1.3Ah Li-Ion Cordless Combi Drill & 74 Piece Drill Bit Set. Power: 18V. Impressive drilling depths –The versatile design lets you drill up to 13mm in masonry, 13mm in steel and 36mm in wood. 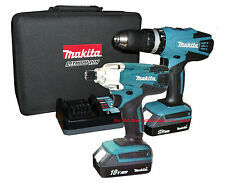 MAKITA 18V Cordless Combi Drill with Accessories in Flight Case. 18V battery power. Reverse function. Carry case. Weight 1.7kg. The HP457 Combi drill has been designed with an ergonomic handle and soft grip for user comfort for maximum thrust when in use. 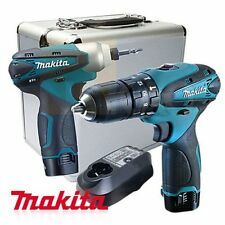 MAKITA 18V Cordless Combi Drill & Accessories. 18V battery power. Forward/reverse function. MAKITA trapano percus. HP331D avvitatore impulsi TD110D 10,8v 2ah CLX202SAX2. CARATTERISTICHE TRAPANO HP331DSAJ. CARATTERISTICHE AVVITATORE IMPULSI TD110D. Fornito con 3 batterie 10,8v 2ah, caricabatterie, kit inserti, bauletto. CARATTERISTICHE TRAPANO HP331DSAJ. CARATTERISTICHE AVVITATORE IMPULSI TD110D. AVVITATORE IMPULSI TD110D. SCOPA ASPIRAPOLVERE CL106FDSAW. CARATTERISTICHE SCOPA ASPIRAPOLVERE CL106FDSAW. TRAPANO A PERCUSSIONE HP331. Makita HP457D Lithium-ion Combi Drill. The machine is fitted with a single sleeve keyless chuck, to enable easy bit installation and removal. 2 x Makita BL1813G Li-Ion Batteries. NOT COMPATIBLE WITH THE LXT RANGE. Makita is one of the leading manufacturer of professional power tools on the market. The HP2050 is a 720 W two speed percussion drill with extra low vibration level to reduce operator fatigue, yet with enhanced working performance. Automatic Spindle Lock. Plug Type: UK. Since then, Makita has expanded across the globe, with representation in over 150 countries and growing! Makita Impact Drill. Based on Korean type(220V). TD090D : Cordless Impact Driver Drill. Coarse thread screw: 22-90mm. No load speed: 0-2400rpm. No load speed: 0-1,300 rpm 0-350 rpm. No Load Speed High: 0 - 1300 rpm. No Load Speed Low: 0 - 350 rpm. HP331D 10,8 V Combi Bohrmaschine. CL106FD 10,8 V Staubsauger. HP331D 10,8 V Combi Bohrmaschine. CL106FD 10,8 V Staubsauger. Akku-Typ - Lithium-Ionen-. Vibration Auswirkungen Bohren in Beton - 8,0 m/². Makita DK1493 Cordless 10.8V Li-ion 1.3Ah TD090DWE HP330DWE Combo Set. <> : Cordless Impact Driver Drill>. Based on Korean type(220V), ± 10% difference can be used. Coarse thread screw: 22-90mm. No load speed: 0-2400rpm.